BAFFIN BAY, Greenland, September 2, 2010 (ENS) – Four Greenpeace activists who climbed a Cairn Energy oil rig in Greenland waters were arrested this morning and are now being held in police custody in Greenland. 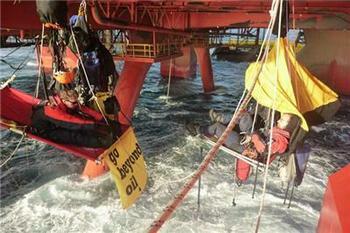 The activists first scaled the oil rig Stena Don on Tuesday. They attached hanging platforms to the underside of the rig where they camped out in tents with self-heating meals until last night. Freezing gale-force winds forced the climbers and Greenpeace campaigners on the ship Esperanza anchored one kilometer from the rig to decide to end the occupation. It took the Greenpeacers four hours of climbing in bitter winds to scale the rig from their hanging platforms up onto the platform gantry, where police were waiting for them. They were taken into custody and flown off the oil rig by helicopter at 2 am. 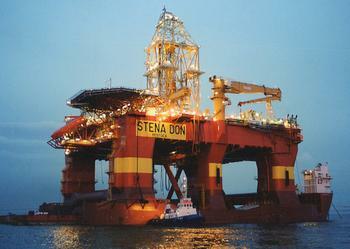 The protesters occupied the oil rig Stena Don, operated by Cairn Energy, to draw attention to their “Beyond Oil” campaign. They say deepwater oil drilling in the Arctic is too risky for the environment and the world needs to switch to cleaner sources of energy to avoid the worst consequences of climate change. “I hope and believe that this action will be remembered as the first step against our blind and reckless hunt for the last drops of oil on the planet,” Stewart said. In London this morning, Greenpeace lawyers threatened legal action against the UK government over its decision to continue issuing licenses for deep sea oil drilling even before the causes of BP’s Deepwater Horizon explosion and oil spill in the Gulf of Mexico are ascertained. Lawyers for the environmental group wrote to Energy and Climate Change Secretary Chris Huhne asking the government to do as U.S. President Barack Obama has done and introduce a moratorium on deepwater drilling for oil and gas. While the UK has not imposed a moratorium on new licensing of deepwater drilling projects, in June, Huhne announced that environmental inspections of rigs in UK waters would be stepped up.